As far as "best-of" DVDs go, they are normally hit or miss but in this case it was a hit and quite a good one too as I found myself being really entertained without taking my eye off of the television for the whole two and a half hours that this programme runs for. There is something for everyone in this list that will appeal to fans of the newer more "technical matches" and for the fans of the old school "no holds barred matches". I also found myself agreeing with 98% percent of this list and that is a very rare thing for me as I'm always bitching about how "Top One-hundred Lists" are always missing stuff I found to be great. The only knock-outs I didn't enjoy were two from the year "2013" as they were dull and boring. All the other knock-outs were pretty darn brutal and it got me very excited. 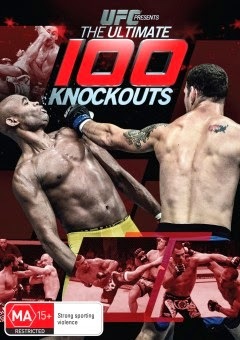 One thing that surprised me about this program was that they didn't just include knock-outs from the UFC as they also included knock-outs from places like: Pride FC, Strike Force, Affliction, and WEC. This was a very nice touch as it makes the list much more exciting and unpredictable. Another genius reason is that it exposes you to MMA shows out side of UFC... Although most of you reading this review is probably (AKA most likely) aware of all of the MMA organizations that I mentioned, I am also aware that some of those organizations are not around any more but for guys like me who don't watch a lot of MMA (and to everyone else who doesn't watch much MMA for that matter) then this is great. One thing that might annoy you about this DVD is that a lot of the fights on this DVD are only highlights and are not the full matches but that's not to say that there wasn't any full fights as you do get some but they are mainly fights that only go for one round. Some of the knock-out moments have bonus interview segments on what the fight was like through the fighter's point of view. When they get to the final ten knock-outs they include interviews and some build-up on all of them and I was mixed as I found some of the build-up moments to be too fillerish but I can see why it was done. Overall there really isn't much that I can say about this DVD as it doesn't take much to describe a "best of" programme but the programme itself is a very good one and you'll find yourself watching this DVD quite a few times. This has got to be one of the better sporting "best of" releases to date and I recommended checking it out. A real knock-out indeed.